Dorisenna Patterson, a lifelong resident of Dobbins Heights, said she and her family are feeling fortunate this winter. Patterson is the first of five families in Richmond County slated for critical home repairs undertaken by either Habitat for Humanity of the NC Sandhills or Military Missions in Action (MMIA), both of which are working in partnership with Enviva on a few of their many home repair projects. The Patterson family project – an urgent roof repair – was completed recently. The Habitat for Humanity of NC Sandhills has served over 300 families in Richmond and Moore counties through home repairs and new home construction since its founding in 1988. 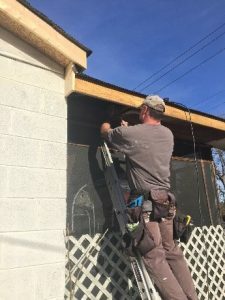 In partnership with Enviva, the organization is embarking on home renovations – including roof repairs or replacement, window replacement, wheelchair ramps and more – for three families in the community, including the Holloways. With other regional partners, the Habitat chapter has been able to complete one renovation a month in the area this year. “Our Repair Program intends to continue to do more work in Richmond County in 2018 to help residents to age in place,” said Jennifer Moree, Lending and Home Preservation Manager, Habitat for Humanity of the NC Sandhills. 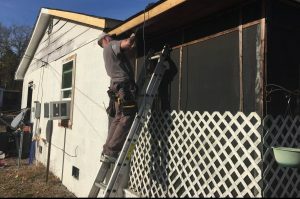 Military Missions in Action, a local nonprofit dedicated to assisting veterans with disabilities, is also partnering with Enviva to renovate the homes of two Richmond County veterans to ensure they can live independently in a fully-accessible home with their disabilities. MMIA plans to completely remodel the bathroom of one of the veterans – including replacing the bathtub with a shower stall – to make it more safe and accessible. The second MMIA project will entail the construction of a wheelchair ramp on the front of another veteran’s home to improve access. Tony Lennon, MMIA Regional Director, states that “MMIA greatly appreciates Enviva’s support for these important projects, which will significantly improve the lives of these deserving veterans.